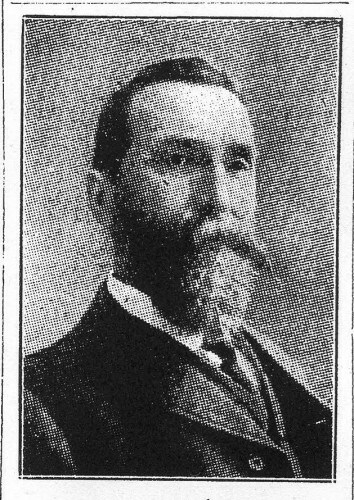 Bio Notes: George Gordon Jenkins was born in 1848 or 1849 in Elgin but spent some of his boyhood in Aboyne where his father was minister of the parish church. He was educated at Aberdeen Grammar School and articled to the civil engineer Robert Anderson who was responsible for the first municipal water scheme for Aberdeen bringing water from Invercannie. During this period Jenkins was successful in various new works around the city and he was thus presuaded to open business on his own account. He commenced practice as civil engineer (architect and surveyor?) at 115 Union Street, Aberdeen in or before 1874, his earliest work being concerned with the layout of cemeteries. In the summer of 1878 he took into partnership George Marr who had begun practice with his father as an architect at Chapelhall of Udny from the 1860s, concentrating almost exclusively on school and farm work. Throughout their early careers, the work of Jenkins & Marr was of a simple and strictly practical nature, but with Mannofield Church (1882), for which an experienced assistant was probably brought into the practice, moved to a rather higher plane. From the earlier 1880s there was briefly a loose partnership with William Davidson in Ellon, the connection with him being through Marr. Jenkins is known to have undertaken engineering projects during his career such as the scheme for obtaining a supply of water from the River Avon of which he made a thorough survey. Jenkins was active in the formation and running of the Aberdeen Association of civil engineers and served as its president after it had been in operation for five years. Outwith his profession Jenkins was a keen mountaineer, taking a great interest in the Deeside hills and local topography. He published 'Hill Views from Aberdeen', which is the the result of a life-time of expeditions and surveys. He was responsible for the design of the view indicator on Brimmond. He also contributed to the Cairngorm Club Journal. Around 1886 Harbourne Maclennan, born 1871 and educated at Elgin Academy and Dunfermline High School, joined the firm as an apprentice, and subsequently made a study tour in Europe: as an academic architect, he was essentially self-taught. He returned to Dunfermline to commence practice in 1895 but was subsequently invited by Jenkins to return to the Jenkins & Marr practice, Marr having died in 1899. The catalyst was probably the commission to design the Masonic Hall in Crown Street, Aberdeen, which he carried out on his own account in 1908-1910. He was belatedly made a partner in 1915, and became sole partner after Jenkins retired in 1921. Jenkins died on 6 October 1923, leaving moveable estate of £13,338 0s 5d. He was survived by his wife Christina and they had three daughters. 1889 Knockespock House Aberdeenshire Scotland Additions -almost a new house. Demolsihed in late 20th century. 1896 Cairnbulg Castle Aberdeenshire Scotland Restoration from ruins. Lodge. Aberdeen Press and Journal 8 October 1923 Obituary. Picture in issue of 9 October 1923. © All rights reserved. From Aberdeen Press & Journal 9 October 1923. Courtesy of Aberdeen Central Public Library.